Who are you? What message are you projecting out to the world? Did you even think you were projecting a message? Maybe you are not consciously trying but by not trying to you are still sending a message. Who are you trying to notify? What information are you trying to present? It’s all about presentation, how we present ourselves helps notify others about who we are. It helps them see what we believe and where we stand. It’s a warning and a beacon. One glance around and you know exactly where you are and where you stand. But the bottom line is that we do it because we all just want to belong. If you were a new visitor to our planet, you would see that we are all basically wearing costumes. Your clothes, your shoes, your hair or makeup, everything you are presenting on your body says something about you. Your costume identifies your tribe. Or in the case of Amazon Indians, your hair and your tattoos. The motive here is to show other tribe members you belong to their tribe and at the same time show everyone else that you are not a member of theirs. Our costumes are really more about exclusion than inclusion. Sometimes people are a little in your face in their efforts to emphasize that they are not a part of your tribe. But it’s all just an effort to belong, especially in younger people. It’s almost a requirement. They need to break away from their parents, from the establishment, to show their independence. And that sometimes requires drastic action to make the right statement. They use bright hair colors and drastic styles, tattoos, logo wear and clothes, piercings, etc. to make their point. They use shock and horror as a tool. I think we have all been there once upon a time. Maybe some of us were more drastic than others. I was 14 in 1964. I was in a band. I grew up at Lake Tahoe and hitchhiked to spend weekends in San Francisco in the Haight Ashbury district. What do you think I was doing? How do you think I looked? Talk about shock and horror. I freaked my family out! But it’s just a period of transition, a transitioning out of one phase into another. Some phases take longer than others and some phases can become almost permanent. I’m sure you know people who are locked into a phase. Does it matter? I don’t think so. But think of all the tribes that you can immediately identify. You can see them everywhere, every day. For example, look at biker clubs. I was at a rally the other day where my friend's band was playing (I was the roadie) and there were about 5 or 6 biker clubs there. For me it was very interesting to see the hierarchy being displayed. With the tattoos, the bandannas, the leather, the patches, the prospects trying hard to belong, to earn their full patch. You can see the whole process of belonging in action. I have no problem with bikers, I get it. I like bikes. My best friend from childhood has been a Hell’s Angel since the sixties. He’s probably one of the few remaining Outlaws alive from the early days of the club. Looking from the outside, although we may not really get how unique it is when several million kids throughout America are dressed the same way, we understand. 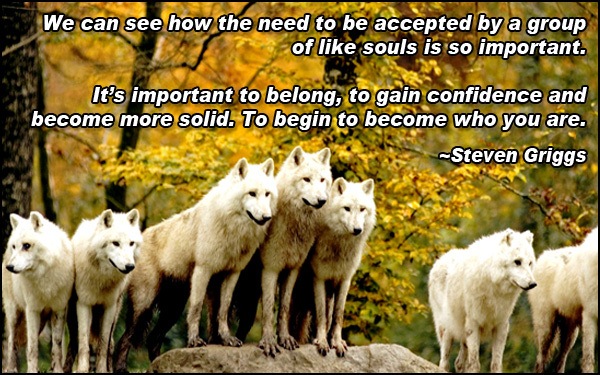 We can see how the need to be accepted by a group of like souls is so important. It’s important to belong, to gain confidence and become more solid. To begin to become who you are. It takes steps, phases and tribes. Because it doesn't stop when you leave one tribe behind, you just become part of another tribe.